It's a little early to be looking at turkey and Thanksgiving stuff already, but here's a product that's hanging out on TJ's "new items" shelf that's just begging for a review. 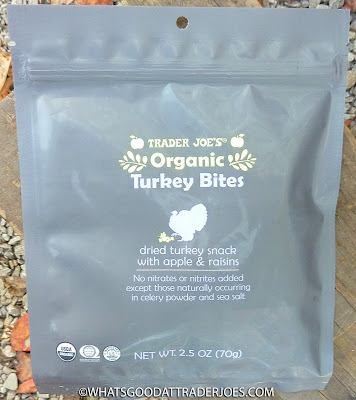 Never had organic turkey bites before? Me neither. Let's explore them together, shall we? Any time I see a shiny, slender plastic bag partially filled with shelf-stable, processed foods like this, I think of astronaut ice cream. I used to love that stuff. So weird and unique—but in retrospect, it's not nearly as good as any decent actual ice cream. I think it was just the novelty of having A) ice cream that didn't need freezing or refrigeration of any kind and B) something that space men (and, ostensibly, extraterrestrials) actually consume. Also, the thrill of the hands-on science museum was heightened by the promise of an astronaut ice cream-induced sugar buzz after a brief visit to the gift shop at the end of the day. Good times. Here, we have astronaut-esque turkey snack bites. I really wish they'd have called the product: Trader Joe's Astronaut Thanksgiving. I would have made sure it got a decent score if that had been the name...IF that had been the name. As is, I'm just gonna give it to you straight that this speculative concoction is a little disappointing. 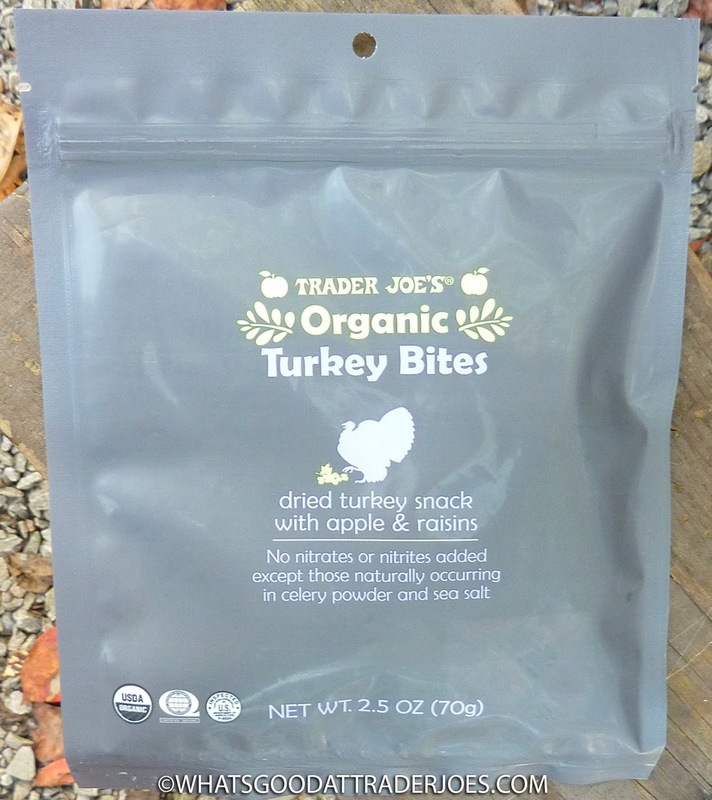 When you Google the title of these bad boys, you get a little snippet from the Fearless Flyer stating "You can join in the cause of advancing snack science today by picking up a 2.5 ounce package of Trader Joe’s Organic Turkey Apple Bites for $4.99." 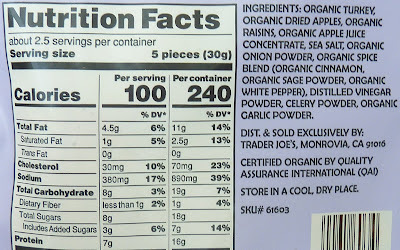 Trader Joe's is giving it to you straight, as well: a purchase of this product is charity, plain and simple. In other words, please empower us to make weird stuff like it in the future. Or don't. The turkey bites are soft little quadrilateral dealies about the size of a domino. You only get 12 or so in a pack. They're fairly dense, so the value isn't terrible, I suppose. I think they're going for a jerky-ish vibe, although, these are much less chewy, leathery, and dry than traditional jerky. I'm not exactly sure what I can compare the texture to—it's, like, maybe somewhere in between room-temperature meatloaf and an RxBar...? Sound appetizing? Didn't think so. Just remember, you're the guinea pig in a study advancing human knowledge of food science...or something like that. The flavor is even more...experimental. It's not unlike that of a turkey-flavored dog treat. Nor is it a far cry from normal turkey jerky I guess, but there're also apples, raisins, and an odd assortment of garlic and other spices that would only go together with fruit in some kind of homemade Thanksgiving stuffing. Again, I guess that's what they're going for. Astronaut Thanksgiving. I really, really want to like them. I do. And I'm sure someone out there does. 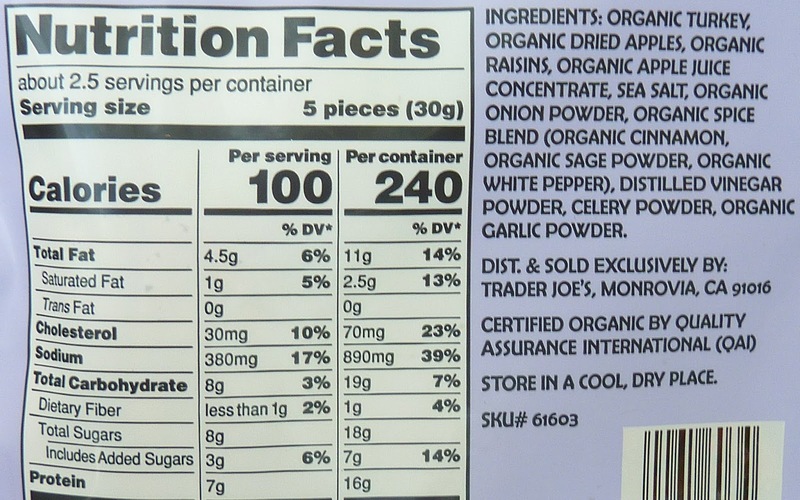 Quirky, weird, protein-rich snacks made with almost entirely organic ingredients? I'm pretty sure Isaac Asimov wrote about these some 60 or 70 years ago, visionary that he was. People laughed at his parallelogram-shaped, compacted turkey and apple bites as "fanciful" and "far-fetched." Most of those critics are long dead...but if they were still around, they'd have to admit: the future is now. these aren't bad they're just so.. nothing. and at $5 way overpriced. They need a flashier package, the current one looks like it would contain dog treats! The contents don't appear to help that notion. Your name of astronaut thanksgiving is way better!! And man, astronaut ice cream was totally amazing mind blowing stuff. Definitely an epic fail for package design here, looks like something you get in a hotel with a shoe polish cloth inside.